Cancer is a disease of the gene, caused by genetic and epigenetic mutations, resulting in the development of malignant cells. 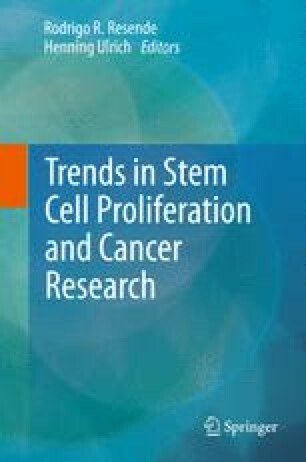 Previous concepts of the monoclonal origin of tumors and the stochastic nature of carcinogenesis are being challenged by hierarchical/plasticity models that predict the existence of tumor-initiating and tumor-propagating cells, which have stem cell properties and are thus highly resistant to therapy. It may therefore be postulated that cancer is a stem cell disease. One of the actively investigated tumors of cancer stem cell origin is glioma, one of the commonest primary brain tumors in adults. In this chapter we shall focus on glioblastoma multiforme (GBM), glioma’s most malignant stage, characterized by enhanced, single-cell infiltration into normal brain. The invasive cell phenotype is the major obstacle for successful therapy, as highly invasive cells that can migrate from the bulk tumor mass cannot be removed by any currently available therapy. Invasion is a complex, stepwise process, initiated at various levels—from gene activation to the level of protein post-translational modification. At the phenotype level, the process is reminiscent of the epithelial to mesenchymal transition in carcinoma malignization, which includes the activation of the so-called migratome, possibly overlapping with proteases, i.e. a cancer degradome. On the basis of the hierarchical/plasticity model of carcinogenesis, the cells undergoing epithelial to mesenchymal transition may also have stem/progenitor cell characteristics. Other types of stem cells associated with tumors are infiltrating haematopoietic stem cells, endothelial progenitor cells and mesenchymal stem cells (MSCs), comprising the tumor microenvironment. Their role and differentiation pathways in tumor niches are the subject of intensive investigations, and unravelling the mechanisms underlying MSC-mediated modulation of tumor behaviour via paracrine and direct interactions with GBM stem cells in vitro may solve the dispute regarding their antimalignant activity, which is currently contradictory to the hypothesis of a possible mesenchymal origin of GBM stem cells. By the same token, MSCs may be novel therapeutic vectors for drug delivery, which are badly needed. Cell therapies using stem cells are promising owing to their selective tropism towards tumors. In particular, autologous MSCs are considered promising at least in some tumors, especially owing to their immunomodulatory potential. However, MSC therapy may have adverse effects, since the role of MSCs in tumor progression has been evidenced. Combined cell-based drug and gene delivery with anti-invasive strategies could therefore contribute to enhanced efficacy of conventional therapeutic approaches in glioblastoma treatment. In this chapter we shall thoroughly revisit the advantages of and obstacles in recent preclinical trials using stem cells for treating brain tumors. The work presented here was partially supported by the Slovenian Research Agency Programme P1-0245 and by the ERA-NET action of the INREMOS project on Systems Biology Tools Development for Cell Therapy and Drug Development—SYSTHER (contract no. 3211-06-000539; 2006-2011).